These previews show examples of styling - but you can edit the colours and fonts etc how you want on the editable vector files in the download. Perfect for graphic designers using Illustrator who need a detailed and versatile vector art base map of the UK, this professional map uses trustworthy Ordnance Survey GIS data organised with Maproom’s easy to style Illustrator layers. This is the most detailed base map of the UK that we sell in the Maproom shop, and it can be used in many applications. It includes approximately 1,850 town points, more than 5,500 major roads, including B roads, all the county and unitary authority administrative boundaries, and a wealth of natural features across the entire United Kingdom. Altogether there are more than 4.29 million vector anchor points. High-resolution Illustrator PDFs included in the download bundle can be zoomed in to any level without loss of resolution. The zoom previews on this page are limited by the maximum dimensions that can be handled by a web image viewer of this type, but the files included in the download package can be zoomed in so that every label is fully legible and sharp no matter what zoom level is used. All the fonts and paths are live and editable on the vector artwork. This zoomed detail focusing on Windsor shows the vector layers that include motorways, A roads, B roads, rivers, lakes, urban areas and administrative boundaries. You can use any of the Illustrator PDFs included either as they are or as a starting point for your own custom map styling. In this example zoomed into the area around Glasgow, all the roads are a single colour, and the labels are white on a khaki coloured background. This preview shows the full extent of the map beyond the initial artboard (framed) in Illustrator. The Illustrator artboard is nominally at dimensions W 182cm x H 268 cm, which is larger than standard poster sizes. These dimensions and scaling are just a useful starting point for designers. You can print the map to cover an entire wall or scale it down to a thumbnail. The map view here is a screen grab scaled at just 4% of the total artwork size. An inset of Shetland is contained within the artboard. However, when you open the vector files, you will find that there is a large area of artwork beyond the artboard, where Shetland appears again in its natural position. The Channel Islands are also included in their geographical location below the southern side of the initial artboard alongside the French coast. The Irish landmass is also included in its entirety. Extending or reducing the initial artboard, or adding multiple artboards, gives designers immense flexibility on ways to use this versatile base map of the UK. To use the map with Shetland in its natural geographical position, for example, simply extend the artboard northwards and delete or hide the Shetland inset. Here the labels have been changed to a serif font (Garamond Pro) and the town points symbol changed in the symbols palette, with muted backdrop colours to give a slightly vintage feel to the map. Changes such as these take only a matter of seconds when working with the built in Adobe Illustrator layers. Superb coastal detail from Ordnance Survey open data enables you to zoom deeply into the map and accurately plot extra elements. For example, we have added ferry routes from Oban, which are zoomed in here at 400% on one of the supplied PDF examples. If you want to print the entire map at a smaller size, you may want to suppress the smaller font layers, such as road numbers, as they may not be legible if scaled down. Alternatively, you can zoom into regions or add extra artboards to tile parts of the artwork at any scale. 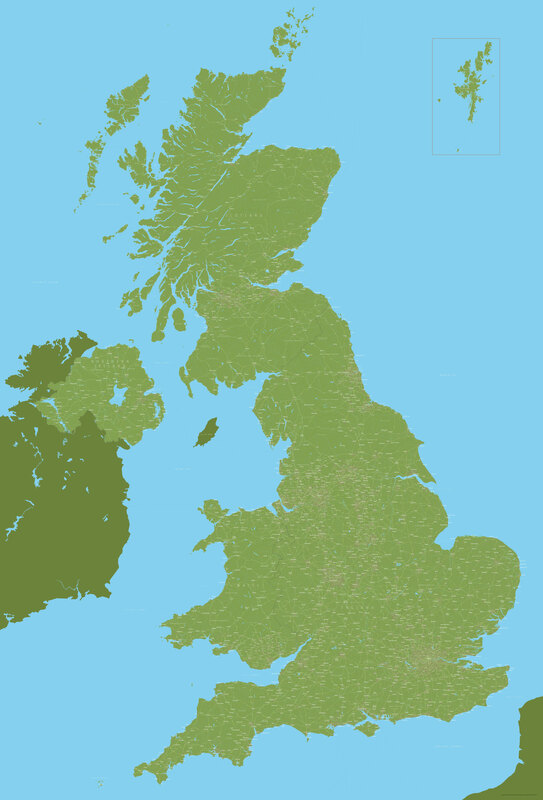 This detailed vector map of the UK is sold on royalty-free terms, which means you can use it in different ways for multiple projects, making it a fantastic resource file for designers and developers, saving money and weeks of work. A copyright notice is included for the Ordnance Survey open data, which can be moved and restyled, though not removed. The full terms and conditions of the royalty-free license are listed here. Please note that the files supplied in the download bundle are all high-resolution and will need to be converted to a smaller file size if you intend to use the artwork in a website. The Illustrator files are supplied in CC (recent Creative Cloud) and older CS versions to preserve layers. An included SVG file is useful for developers, and there is also an optional large (200mb) EPS file. Please contact us if you require other formats. 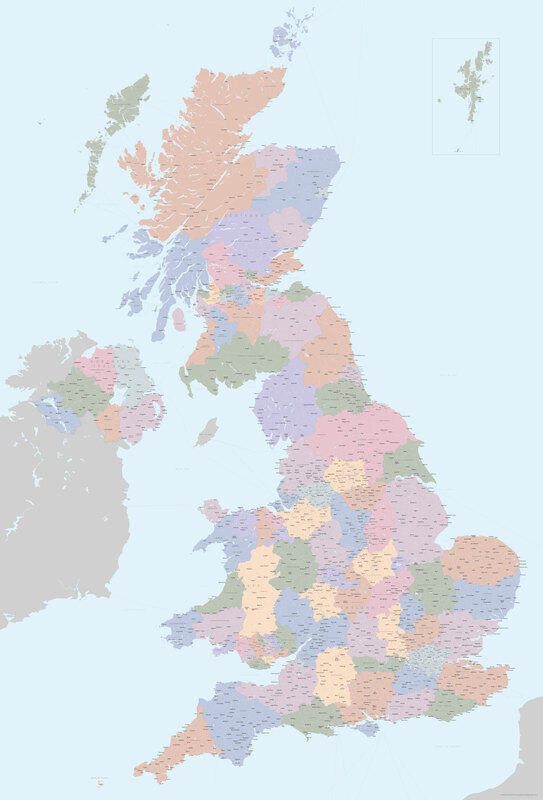 One of the versions in the download package includes an organisation of sub-layers for counties, unitary authorities and council areas of England, Scotland, Wales and Northern Ireland. These enable you to easily identify and colour these areas individually. This editable map base is suitable for commercial and professional uses. Do you need help to customize this map? Our maps are easy for designers to edit using Adobe Illustrator or other vector graphics software. Even beginners can make simple colour and text changes. (See how to customize.) But if you have never edited vector artwork before, you might prefer to commission us to customize your map. Can't find the right map? We have detailed GIS map data for the whole country, including roads, building footprints and waterways. We can create an editable vector map in Illustrator PDF and other formats tailored to your specifications at a reasonable price. Visit our custom map enquiry page.